If you just started planning a roofing business, you may want to start here: How To Start A Roofing Business. Here are a list of ideas when trying to come up with your own roofing contractor business name and/or tagline. There are a number of ways to come up with a name for your roofing company. 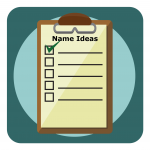 This list is provided to help get the name-choosing process started. Keep in mind some of these roofing company names may already be taken in your location, or even nationally. If you are planning to have a website, some web addresses using your selected name may already be in use. Some roofing company names may even be trademarked, so make sure you can legally use the name you choose before going through the time and expense of having a logo created and promotional materials printed. There are a number of reasons why you should register your own website domain name for your business at this time also. After choosing your name, you will benefit from taking advantage of 15 low-cost or free ways to get roofing customers. You can get a FREE domain with web hosting purchase and check for website name availability here.